Collecting Doulton rabbits and hares. 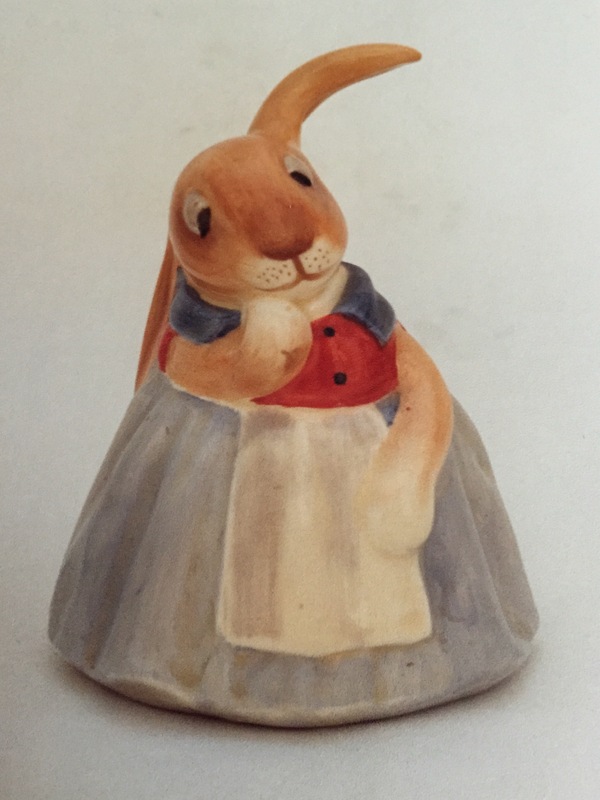 Mary Bunnykins (1939) who bears a striking resemblance the the earlier lop earred rabbit below. There are stories of a school age Charles Noke borrowing clay from the Worcester factory, a favourite visiting place for his father, to model animals and it was Noke who started the HN animal collection at Burslem. 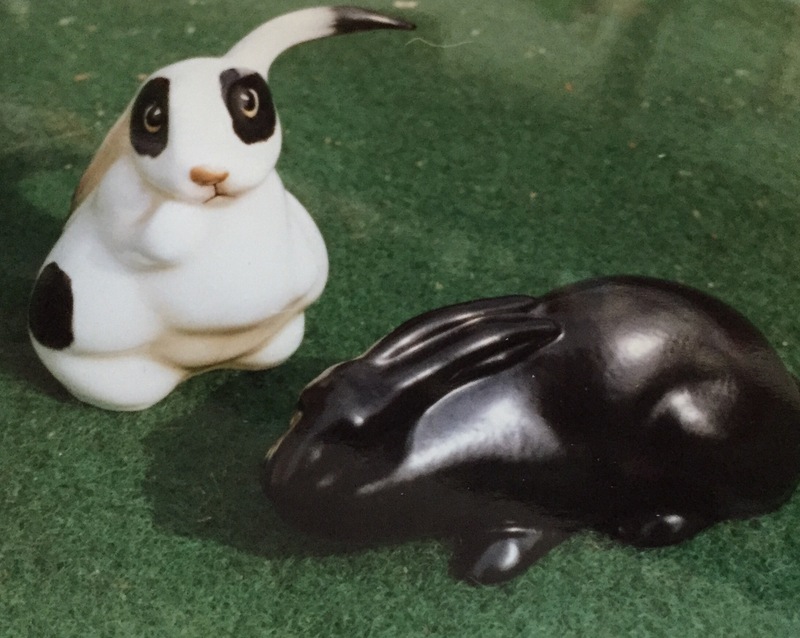 Lop earred rabbit and hare in a black glaze. 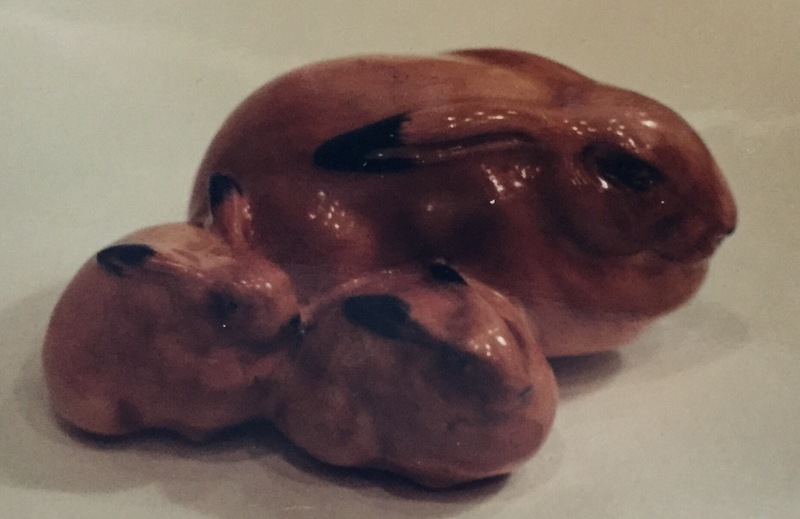 There are many hare and rabbit models to collect, with many of them also found in flambé. 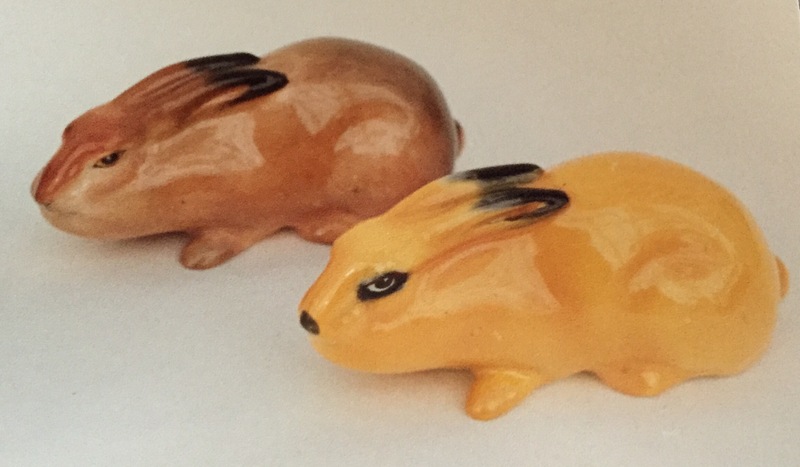 These early models generally ceased production in all colourways -natural, flambé or other – by the mid 20th Century but a handful including the small lop earred rabbit continued to the end of the 20th Century so if collecting it is essential to read up on production dates to gauge the prices you should be paying. Very unusual rabbit and young. A larger version was made of this model as often happened at Lambeth, intended to be a garden ornament. The rabbit and the hare have a strong history in myth and folklore, stemming back through their apparent 4000 year history – explaining mankind’s on-going love of these furry animals. Today the rabbit in particular is still a popular domestic pet. Two further versions of the Hare HN 126 & HN 273. The Chinese believe the hare or rabbit is ‘the man in the moon’ whilst Taoist beliefs say that these lovable animals derive their essence from the moon! Perhaps it is their nocturnal habits that have led to these beliefs! Doulton animals offer collectors -old and new – a great scope for building a collection for the HN animal collection continued into the post war period up until the 1980’s with new introductions throughout those years and in the 1990’s there was a new range -the DA range of animals introduced. Even today Doulton produce the occasional animal.